Phew, the holiday season, amiright?! We’ve been busy as hell trying to cram as many bug fixes and cool little additions into Skyfront as we can before 2017 draws to a close. 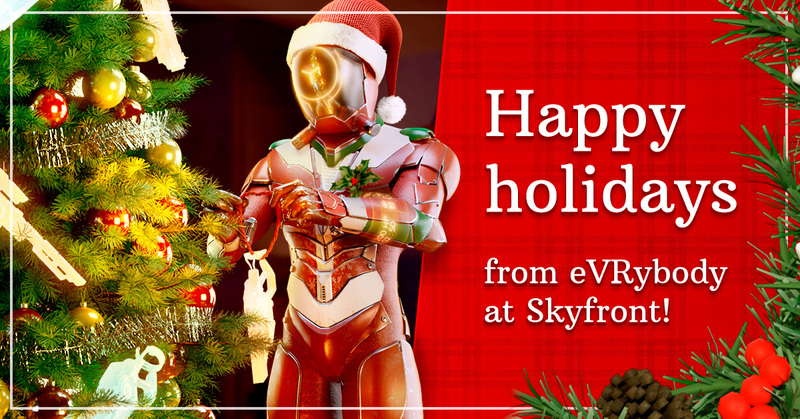 Our biggest announcement for the holiday season is the Skyfront Winter Onslaught competition in partnership with Aerial Sports League (ASL)! We are beyond excited and humbled to be working with such a huge name in aerial sports. Winter Onslaught will be our first step towards a crossover competition combining VR and live-action drone combat. Winter Onslaught will take place in two rounds from December 22nd until January 4th and allows you to win some killer prizes, including Steam Gift Cards and a freaking drone! Read more about the event on our Discord channel (https://discord.gg/V6tYC2t) and stay up to date by following us on social media (links below). Oh, and to sprinkle a little holiday spirit into the mix, we’re throwing in this adorably dorky Christmas skin because… well, mostly, why not? But on the practical side, this skin is the first glimpse into the future of character customisation in Skyfront. We have also added an in-game headshot notification to really celebrate how good of a shot you are! Yes, the artwork is just temporary and will be replaced with some fancier graphics very soon. To make loadout changes more seamless, we removed the ‘Apply’ button, meaning that loadout changes are now saved automatically. Changes to look out for in the upcoming months – user statistics. – Missing collision boxes on several of the objects on the Egypt level, incl. the gloomy Anubis statue, have been replaced.